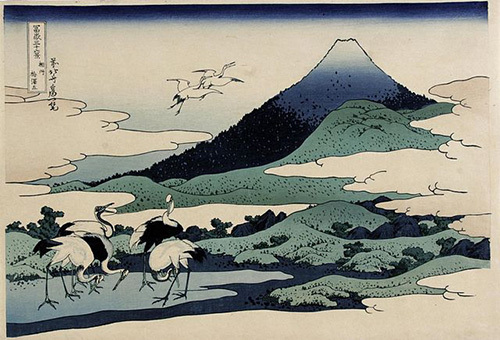 Hiroshige was the son of an Edo fire brigade warden. Even at an early age he was already doing sketches and it was assumed that he received some training from another fireman who studied under a traditional Kanō school of painting master. He inherited the post his father held as a fire warden when the latter died. He entered the school of Utagawa Toyohiro, an ukiyo-e master around 1811, who harnessed his full potential through his refined and modest taste, which helped Hiroshige to develop his own style that eventually led to him being able to express it through his beautiful landscapes. Hiroshige received a school license and a nom d’artiste at age 15, but it was only in 1818 that he had his first work published via a book illustration, wherein his signature appeared as Ichiyūsai Hiroshige. When his own son was old enough, he relinquished his post as fire warden to his son so he can devote his time to his art. Biographical materials about Hiroshige and artists like him during that period were scarce because they were only considered as artisans, despite the fact that their works were highly appreciated and at times, collected. Art historians used his works to trace his adult years. Based on collected materials, historians surmised that the artistic life of Hiroshige could be defined in different stages. From 1811 to 1830, he was a student who followed the work of his mentors, thus he created figure prints of samurais (warriors), actors and beautiful girls. The years 1830 up to around 1844 were considered the second phase of his artistic life, the time when he started creating landscapes. His early works during this period showed his romantic ideal of what constituted beautiful landscapes and he also created flower-and-bird prints. It was during this period that he created his masterpiece, the “Fifty-three Stations of the Tōkaidō,” as well as several print series showing Japanese landscapes. The last stage of his career was from 1844 to 1858, where he mainly created landscapes and landscapes with figures. 55 prints. The other two showed the beginning of the highway he traveled and the scene during his arrival in Tokyo. The other 53 prints were of the stations he stayed in when he made the trip from Edo to Kyōto in 1832. This series became so successful and made him quite popular. He chronicled many of his trips around Japan later. Some of them included the “Famous Places in Kyōto,” “Eight Views of Lake Biwa,” “Sixty-nine Stations of the Kisokaidō” and “One Hundred Views of Edo” that he created between 1834 and 1858. It was estimated that Hiroshige created about 5,000 to 8,000 prints during his career and that from some of the woodblocks he created, about 10,000 were made. Compared to his contemporary, Hokusai, Hiroshige’s masterpieces showed a human touch that no other ukiyo-e artist was able to achieve. He had the skill to capture the very essence of the scene he witnessed, thus he was able to portray beauty that was intimate and tangible. Hiroshige commanded landscape printmaking and his travel prints showed travelers in various situations as they went from stop to stop along well-known routes. He showed them traveling in snow, in the rain and in all the seasons. 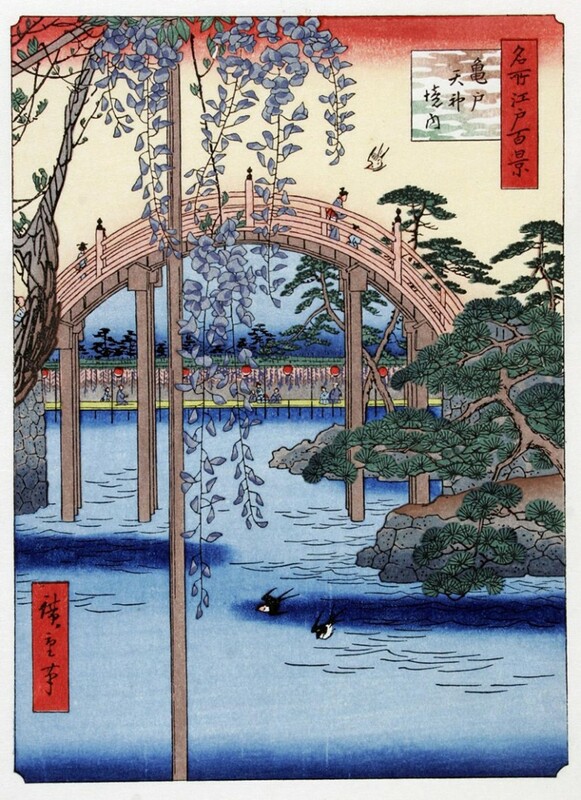 Together with Uoya Eikichi, a publisher, Hiroshige created a series of prints using the finest printing techniques available at that time, employing exquisite color gradation with iridescent effect through the addition of mica. The luxury edition of his prints were used for embossing, blind printing, fabric printing and glue printing. He was an ukiyo-e master who was also known for his striking colors, the seasonal allusions and his very unexpected vantage points.